Google Maps for Mobile 4.4 has arrived, along with a 'Places' feature for Android. The sixth update in six months, Google Maps for Mobile 4.4 is available for handsets toting Android 1.6 and above and brings new functionality. "With today's launch of Google Maps for mobile 4.4, we're introducing an even easier way to find places around you: a dedicated Places icon that lets you quickly look up nearby places and pick a place to go using updated Place Pages, just like on your computer," explained Michael Siliski, product manager for the Google Mobile Team. 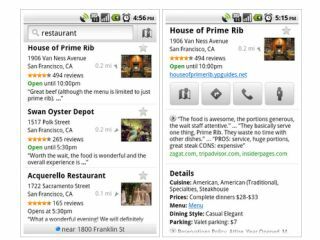 "Press and drag it right onto your home screen to use it when you're looking for a restaurant, shoe store, movie theater or any other type of local business. "You'll get a detailed list of all the nearest places and can choose one to learn more about it on its Place Page." Google has already highlighted one potential use: "You'll also notice that the search results list now highlights business opening hours in addition to compass direction and distance - consider it your late night caffeine radar." You can get Google Maps for Mobile 4.4 from the Android marketplace now, and Google promises that BlackBerry users will be getting the update soon.